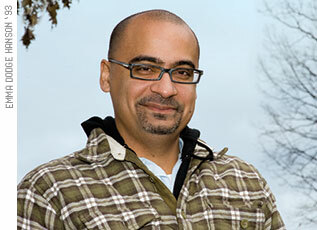 Author Junot Díaz relaxes on campus before his public reading from The Brief Wondrous Life of Oscar Wao. Cited by critics as “street-smart” and “fueled by adrenaline-powered prose,” the novel won a Pulitzer and a National Book Critics Circle Award. Díaz was the keynote speaker for Skidmore’s celebration of Latino Heritage Month, organized by the student club Raíces.